Disclosure: My son and I are receiving complimentary Invisalign® treatment, but all opinions expressed are my own, honest assessment of our experiences. Hooray, I’m back again with the next installment of our adventures! 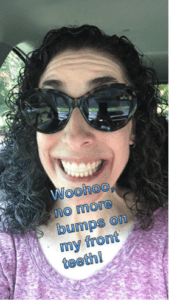 When I last wrote about how our Invisalign treatment was going, both my son and I were settling in pretty well and getting used to our new lives with aligners. Some of it was even easier than we’d expected; some of it was a little bit more difficult. On the whole, though, both of us felt the adjustment period was bearable and then our new routines became habit. I don’t remember ever noticing, with conventional wire braces (back in the Stone Age, when I was a teenager), that my teeth were starting to look straighter. I mean, at some point toward the end I could see that change had occurred, sure, but for the bulk of the process… not really. As I’ve switched out my Invisalign aligners each week, though, I tend to stop and compare the old set to the new one, and I can see the movement from one week to the next. I’m sort of a nerd so I have enjoyed that a lot. As the original crowding and overlap of my bottom teeth was what I was most self-conscious about, it’s been extremely gratifying to be able to take a look in the mirror and see how much better my smile looks, every single week! 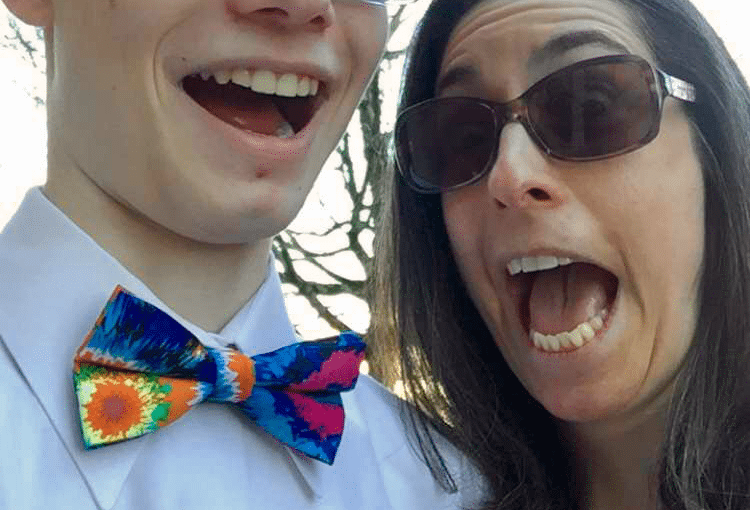 When I asked my teen son if he was noticing differences in either how his teeth felt or looked, as he went along, at first I was treated to a lecture about how he doesn’t spend a lot of time looking at his own teeth. (Should’ve seen that one coming, I guess….) But then he surprised me by adding that he can definitely feel a big difference, and has been noticing it since a couple of months into treatment. As he explained it, he didn’t realize how uneven his bite was, prior to Invisalign treatment, but as his teeth started shifting in a more balanced arrangement, he says he noticed that his jaw didn’t feel as tight as it used to. He also said he thinks he clenches his teeth and grinds them less often than he used to, which is something I have noticed, as well. At about the midway point of my anticipated treatment time (maybe the third-of-the-way point, for my son) we both saw the orthodontist for what they call a “revision appointment.” Because your initial collection of Invisalign aligners is based upon your pre-treatment scans and anticipated tooth movement, there are certain points where they like to stop and assess and re-scan to see if any changes need to be made. At my “revision appointment,” I was deemed to be right on track, no changes needed. (I’d love to tell you that this is because I’m awesome, but I don’t think it had anything to do with me. My teeth didn’t have all that far to go and did exactly what they’d anticipated, is all.) At my son’s appointment, they determined that his tooth movement related to the rubber bands he wears between the upper and lower buttons had proceeded as anticipated… on one side. I can’t remember if one side had moved faster than they thought it would or if the other one moved slower—not that it really matters—but the revision instructions were to continue wearing the rubber bands on one side only, and he was allowed to give up the rubber bands on the other side. My son commented several times in the following couple of days that wearing a rubber band on just one side “felt weird,” but when I asked him about it a few weeks later, he said he was used to it now and it was fine. As I mentioned before, the biggest sticking point for me with my “nearly invisible” aligners has been that I have so many attachments on my front teeth, I feel like it’s obvious that I’m undergoing orthodontia. During my first revision appointment I jokingly told the orthodontist that he could take the attachments off those front teeth if he wanted. I wouldn’t mind! He chuckled and told me to be patient, because they’d be coming off sooner than I thought. I figured he was placating me, but my second revision appointment rolled around just about a month later (this time my son was not due for a revision, because I had reached the end of my initial allotment of aligners, while he still had a couple months’ worth to go) and after being examined, the orthodontist told me it was time to remove my front attachments. Hallelujah! It took fewer than 10 minutes to grind down the unnecessary bumps (remember, they’re made of dental amalgam, so rather than metal pieces which have to be pried off, potentially placing stress on the teeth, these can simply be sanded off), and I ran my teeth over my once-again-smooth teeth, positively giddy. And then… I had to put my Invisalign trays back in, and of course they still had the bumps where my attachments used to be. Bummer. I was quickly reminded that my next (and final!) batch of aligners would now be ordered and they would be smooth, and I’d be finishing the remainder of my treatment time without those super-obvious attachments in the front. Two weeks after my attachment removal, I came back in to get my last series of Invisalign aligners. Imagine my surprise to hear that before they let me have them, they would need to… add a couple of attachments. What?? Well, just as the initial scans are used to formulate a treatment plan that’s a collaboration between your orthodontist and Invisalign, any revision is also handled as a similar negotiation. Happy with my progress thus far, and knowing how unhappy I’d been with my front attachments, my orthodontist decided I could finish treatment without them. Invisalign agreed, but suggested he add just a couple of attachments on two side teeth to facilitate the final movements needed. (Remember—Invisalign aligners can only push, not pull, so some movements require better purchase on a given tooth or teeth in the form of an attachment.) I may have grumbled a little, but the new attachments were far enough back that they’re really almost impossible to see. And then I got my new batch of Invisalign aligners—perfectly smooth across the front!—and suddenly I was smiling a whole lot more. My teeth are nearly picture-perfect at this point. I’m almost done. The best part? The other day I was out to lunch with a friend I hadn’t seen in a while, and when I started to pop out my aligners and put them in my case, my friend asked what I was doing. I told her, and she said, “Oh, I didn’t even notice there was anything on your teeth! So they’re like… invisible braces?” I restrained myself from doing a victory lap around the restaurant, but I wanted to do one. Tune in next month to hear how we’re doing at the finish line. Or go ahead and find a local Invisalign provider for yourself right now!